Just as a reminder, the unit mission is below. This is our final goal for the unit. 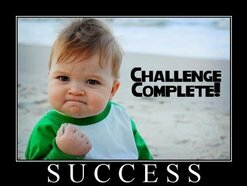 To meet this goal, each lesson will have targets that you must meet in order to make this goal. The live action role play lesson is this first lesson in the World War I unit. The LARP targets are listed below the mission. ​What was World War I? What caused it? How was it fought? How did it end? What was the Impact? An international crisis is a conflict or act of aggression between two or more nations that have a high probability of leading to war. An international crisis does not usually just occur after one event or situation. Many things lead to an international crisis so that one act of aggression ends up sparking war. On the world of Armythia, eight nations emerged as the dominant world powers. Each nation gained the support of their people in establishing their national image or identity. The people felt such pride and loyalty to their nations that they began believing their own nations to be superior to all others. Each nation, then set out to prove their superiority by building up vast militaries and equipping their militaries with the latest technology. The eight nations used their militaries to conquer weaker and less developed nations so they could feel important, gain respect from the other empires, and to take natural resources from their conquests. Becoming the most respected empire was the most important goal of each of the eight world powers and they would stop at nothing to reach their goal. The race for power and prestige created a cloud of tension over Armythia and this tension put all the nations on edge. International tension combined with lust for power produced a toxic environment where it would only take one small situation...one small disagreement to spark an international crisis that could blow up Armythia in a dangerous and devastating world war! 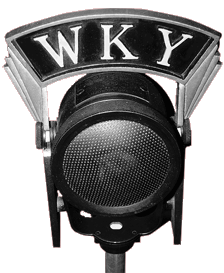 Follow along and listen to the World News Broadcast published below. The International Press has learned that a Zydorian extremist faction has staged a massive armed attack on Aratu and have made their way to the capitol city. Several government facilities have been bombed but the Aratuian Army has successfully defended the capitol building and maintains control over their capitol city. The Zydorian extremists have taken control of Aratu's East River and a section of land on the Artuian border and claimed it for Zydor. Aratuian officials report that this attack was not orchestrated by extremists but by the Zydorian government. They believe the Zydorian government gave the extremists the weapons and supplies they needed to attack so that Zydorian officials could win back Aratu but deny responsibility for the invasion. The Aratuian people are outraged and are asking other nations to help them stop this act of aggression, not only to help Aratu, but to keep Zydor from doing this to anyone else as well. The International Press confronted lead Zydorian officials about the accusations. They have refused to comment on the current crisis. This leads to speculation that Aratuian officials are making a legitimate charge. Using Aratuian surveillance balloons, The International Press Association has confirmed that Zydor mobilized two massive groups of troops. One army is mobilized on Zydor's border with Reyden. The other army is mobilized on Zydor's border with Calleaux. The neutral nation of Thal has offered to host a world summit at their national capitol in order to resolve the current conflict. The eight major empires have agreed to meet. Before we go any further it is important that we cover the following vocabulary terms. A national position is when the majority of a nation's citizens and its government leaders hold a unified opinion or point of view about a world issue, situation, or event. A plan of action is a diagram that shows the steps a nation will take or the procedures it will follow when presented with specific situations or circumstances within a major crisis or event. A plan of action includes a contingency plan. 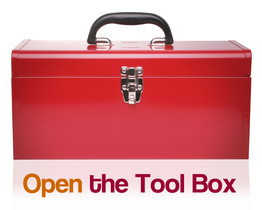 A contingency plan is an outline of procedures for what to do if your plan of action fails. 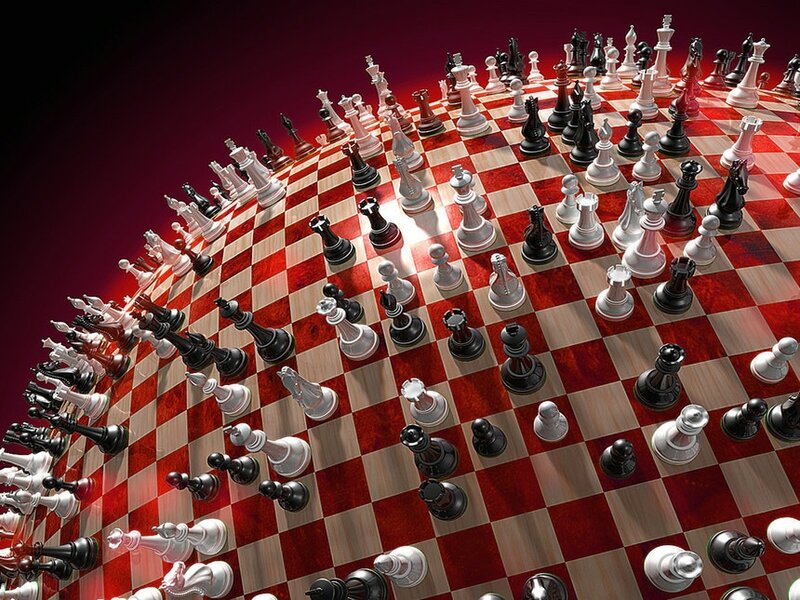 A ​foreign policy is a nation's strategy or plan for dealing with other nations. Now, each nation needs to discuss the World News Report. You need to read and answer the questions under "Analyzing the Situation" in your Intel Folders on pages 32 - 33. 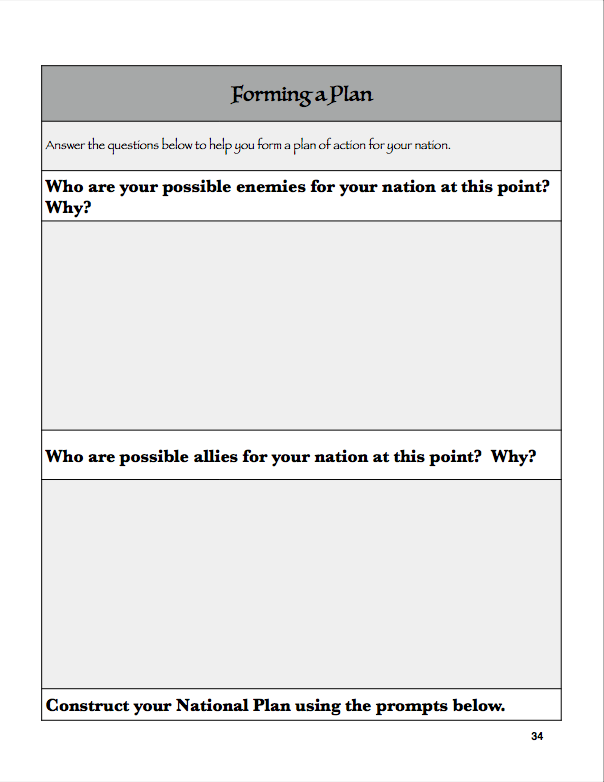 These questions will help guide you in determining your national position, creating a plan of action, forming alliances, and creating a contingency plan for your nation. Don't just breeze through these with minimal thought! Really think about each answer. Failure to do so will result in the demise of your empire! The Analyzing the Situation Pages in your Intel Folders are embedded below so that everyone can see it and those who are absent can go over it at home. Do not do the Lesson 6 Online Chronicles until you are told to do so. If you do, you will be deducted 10 points. Wait until we finish the lesson and discuss it as a class. After you answer the questions, you should have the information you need to determine a national position and create a plan of action and contingency plan. Answer the questions on pages 34 - 35 using the information you gathered from answering the Analyzing the Situation Questions to create your National Plan of Action. The National Plan of Action Pages in your Intel Folders are embedded below so that everyone can see it and those who are absent can go over it at home. Now, it is time to make alliances with other empires. Use your plan of action/contingency plan to determine who you want to be Allies with. 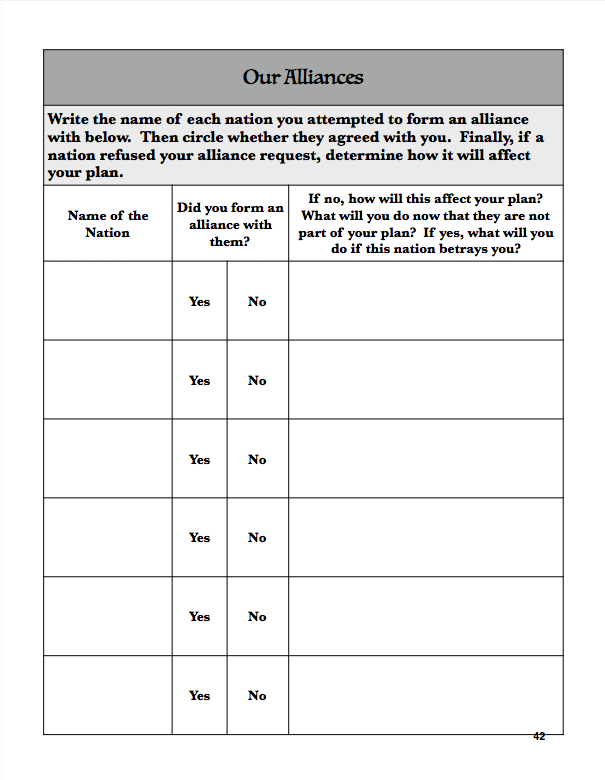 Fill out the Alliance Agreement in your nation. Ambassadors will go to these nations and ask for an alliance. Other group members will stay and listen to other nations who wish to form alliances with them. If both nations agree to an alliance, both nations will sign the agreement. Yes, you can break an alliance with another nation, but remember, if other nations know that you have broken an alliance, they will be less likely to trust you or to form an alliance with you. You may also choose to practice the policy of isolationism. Remember, isolationism is the policy of is staying out of conflicts and political affairs with other nations. This means you will not make alliances with anyone. You want to be left alone. 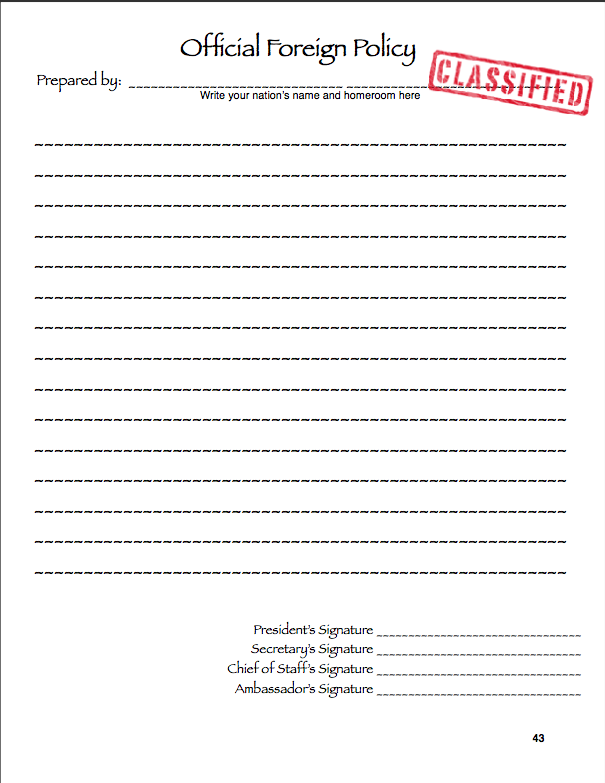 The Alliances Contract in your Intel Folders is embedded below so that everyone can see it and those who are absent can go over it at home. There are 6 of these in your folder, but only one is embedded here. At this point, you need to analyze your alliances. As a group, look at all the alliances you formed, that you denied, and that you tried to form but were rejected by the other nation. What did you learn from each scenario? How did each one of these scenarios change your National Plan of Action and Foreign Policy? 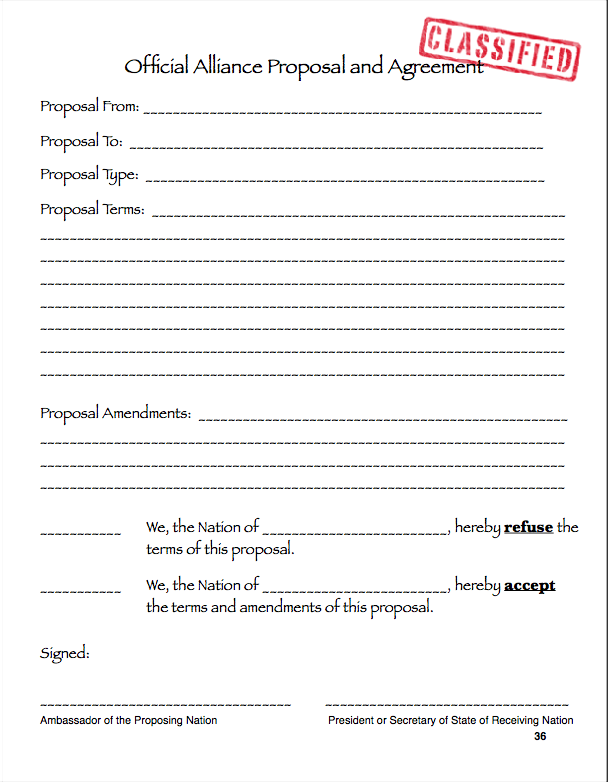 Complete page 42 in your intel packet to help you determine your contingency plan and foreign policy. The Analyzing Alliances Page in your Intel Folders is embedded below so that everyone can see it and those who are absent can go over it at home. The next step in this process is to write your Foreign Policy. In your National Intel Packets, you need to discuss your overall plan. This is the whole plan including all the secret information that you planned and all of the things you plan on telling other nations. On page 43, write this plan. Begin with your goal, what do you want? How will you get it? Will you form alliances? Will you stay neutral? Will you invade? Will you betray your alliances? The Foreign Policies Page in your Intel Folders is embedded below so that everyone can see it and those who are absent can go over it at home. The final step in the process is to write your National Positions. What will you say your nation's position on the situation between Zydor and Aratu is at the World Summit in Thal? In your National Intel Packets on page 44, write what you plan on saying. Remember, this is only your position on the situation between Zydor and Thal and what you will do in this situation alone. This is also only what you want the public to know. 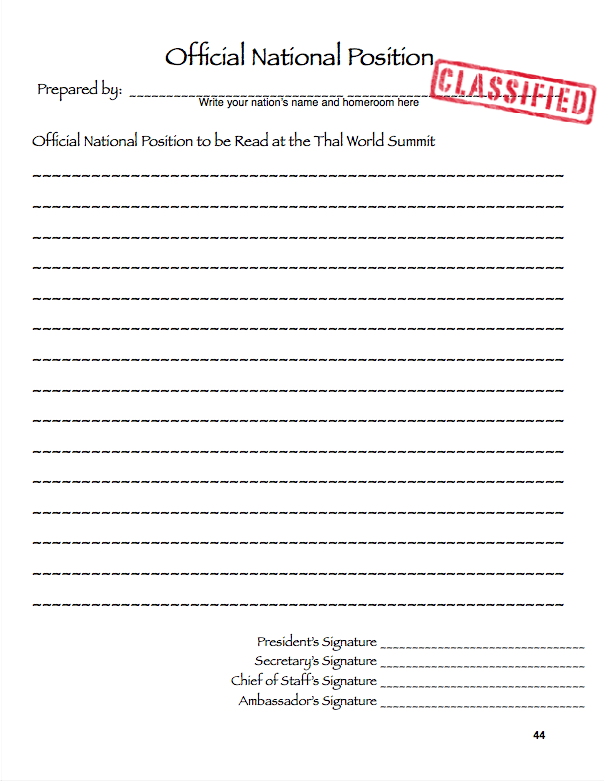 Do not share in secret plans or secret alliances with anyone at the World Summit. You will have a chance to follow through on your foreign policy next week. The National Positions Page in your Intel Folders is embedded below so that everyone can see it and those who are absent can go over it at home. Challenge 6 Lesson Chronicles Directions: Remember, your Lesson 6 Chronicles are all online. Click on the icon to the left to complete your Lesson 6 Chronicles. Your score will come back to you instantly. Do not do the Lesson 6 Online Chronicles until you are told to do so. If you do, you will be deducted 10 points. Wait until we finish the lesson and discuss it as a class.